We are immensely saddened by the news that Helen Dunmore died on 5 June 2017. She was 64, and had been suffering from cancer. She was one of Bloodaxe's first writers, publishing her first collection, The Apple Fall, in 1983, and went on to publish all her poetry with Bloodaxe. Her latest collection, Inside the Wave, which was her tenth poetry book, appeared in April of this year, includes poems relating to mortality drawing on premonitions and experiences of death and serious illness. She also published her final novel, Birdcage Walk, this spring, along with an article in The Guardian on facing mortality and what we leave behind, which can be read here. The day before she died, Inside the Wave was The Observer’s Poetry Book of the Month, accompanied by the poem ‘Terra Incognita’ from the collection. Her final poem, 'Hold out your arms', written on 25 May just ten days before her death, was read on Front Row and published in The Guardian (it can be read here), and has been added to the reprint of Inside the Wave, which is now available. Helen was widely admired as a poet, novelist, short story and children's writer. Her poetry books have been given the Poetry Book Society Choice and Recommendations, Cardiff International Poetry Prize, Alice Hunt Bartlett Award and Signal Poetry Award, and Bestiary was shortlisted for the T.S. Eliot Prize. Her poem 'The Malarkey' won the 2010 National Poetry Competition. Her earlier work is available in Out of the Blue: Poems 1975-2001 (2001), which was followed by Glad of These Times (2007), The Malarkey (2012). She published twelve novels and three books of short stories with Penguin, including A Spell of Winter (1995), winner of the Orange Prize for Fiction, Talking to the Dead (1996), The Siege (2001), Mourning Ruby (2003), House of Orphans (2006) and The Betrayal (2010), as well as The Greatcoat (2012) with Hammer, and The Lie (2014), Exposure (2016) and Birdcage Walk (2017) with Hutchinson. Born in 1952 in Beverley, Yorkshire, she studied English at York University, and after graduating in 1973 lived in Finland for two years, before moving to Bristol. The Poetry Society's obituary includes some of the many tributes from writers and readers that have been posted on social media. Radio 4’s obituary programme included a recording of Helen reading the tile poem from Glad of These Times at the end of their 16 June edition. This recording was taken from The Verb: Helen Dunmore Special, originally broadcast in February 2017 and repeated on 9 June in tribute to Helen (no longer available online). 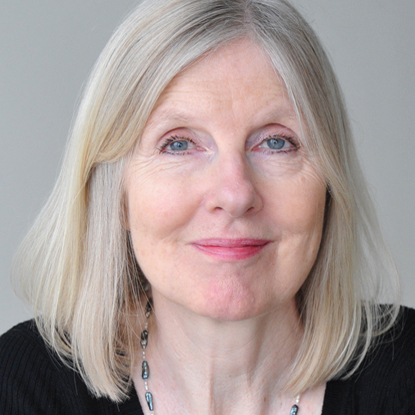 Radio 4’s poet-in-residence Daljit Nagra paid tribute to Helen Dunmore on Front Row on 9 June. He described Helen as ‘first and foremost a poet’, and noted that Helen had been writing poetry for over a decade before she started writing novels. He was one of the judges for the National Poetry Competition the year that Helen Dunmore’s poet (submitted anonymously) was the ‘unanimous’ winner. He quoted the first three tercets from that poem, which is the title poem of Helen Dunmore’s 2012 collection The Malarkey. A clip of Samantha Bond’s reading of Helen Dunmore’s final poem ‘Hold Out Your Arms’, first broadcast on Front Row of 7 June, was also played. Presenter Jane Garvey paid tribute to Helen Dunmore on Woman’s Hour on 7 June, and played a clip from Helen’s last appearance on the programme, when she was speaking about her novel Exposure. Front Row ran a tribute to Helen on 7 June. It followed an interview with the winner of the Bailey’s Prize for Women’s Fiction; Helen Dunmore was the first writer to win this prize back in 1990 when it was The Orange Prize. Helen’s final poem ‘Hold out your arms’, written just 10 days before she died, was read by Samantha Bond. John Wilson noted that the poem is included of the reprint of Helen’s final collection Inside the Wave. Programme details are here (no longer available to listen to). 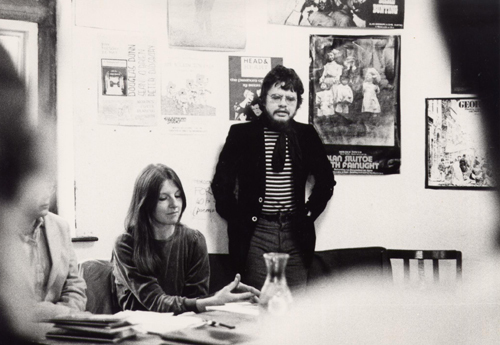 Helen Dunmore pictured in 1983 at the launch of her first collection, The Apple Fall, at Newcastle's Morden Tower. Neil Astley is introducing her with (far left) her fellow reader Carol Rumens. Photo by David James. Filmed at her home in Bristol in June 2007, Helen Dunmore reads six poems: Wild strawberries’, ‘When You’ve Got’, ‘Candle poem’, ‘City lilacs’, 'Glad of these times' and ‘Dolphins whistling’ from Out of the Blue: Poems 1975-2001 (2001) and Glad of These Times (2007). This film is from the DVD-book In Person: 30 Poets, filmed by Pamela Robertson-Pearce, edited by Neil Astley. A special edition of Open Book, recorded at Helen Dunmore’s home in Bristol, aired on 12 March. Helen Dunmore was speaking about her new novel Birdcage Walk. She also spoke movingly about being diagnosed with a serious illness while writing this novel, and how that affected her work.